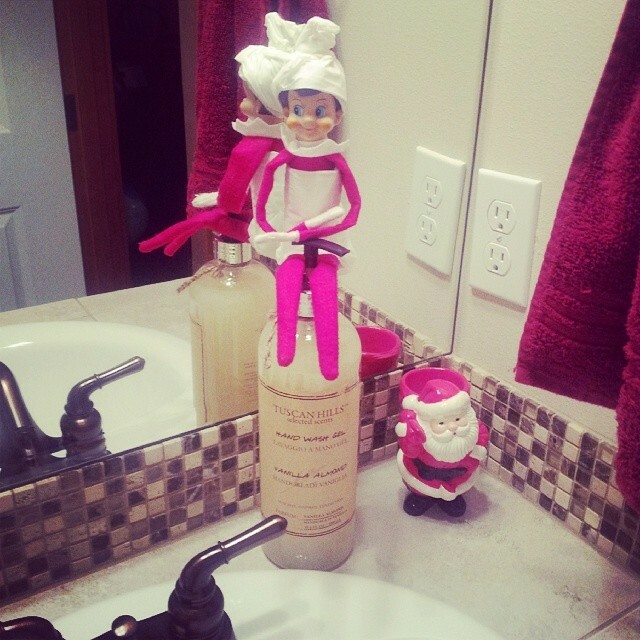 Easy and Fun Elf on the Shelf Ideas – Under ten minutes. 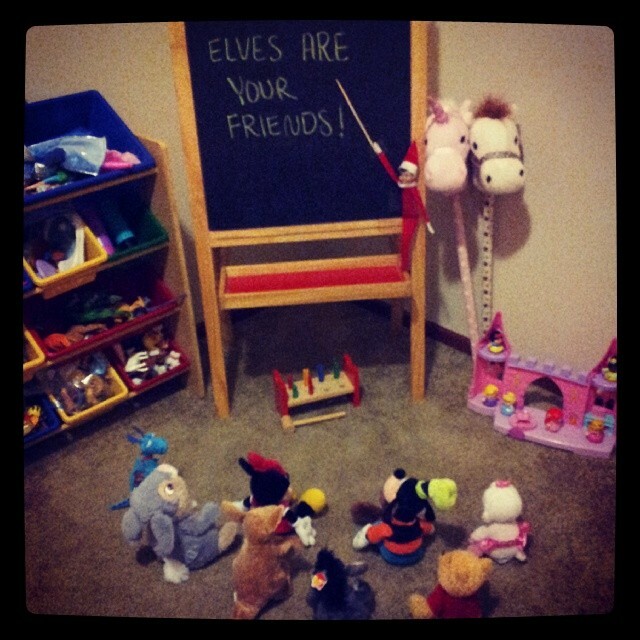 They (a) hate the elf, think the elf is creepy, think the elf is stupid, think the elf is wrong, think people use the elf to manipulate their children into behaving when they should just be parents, or think the elf is too much work. 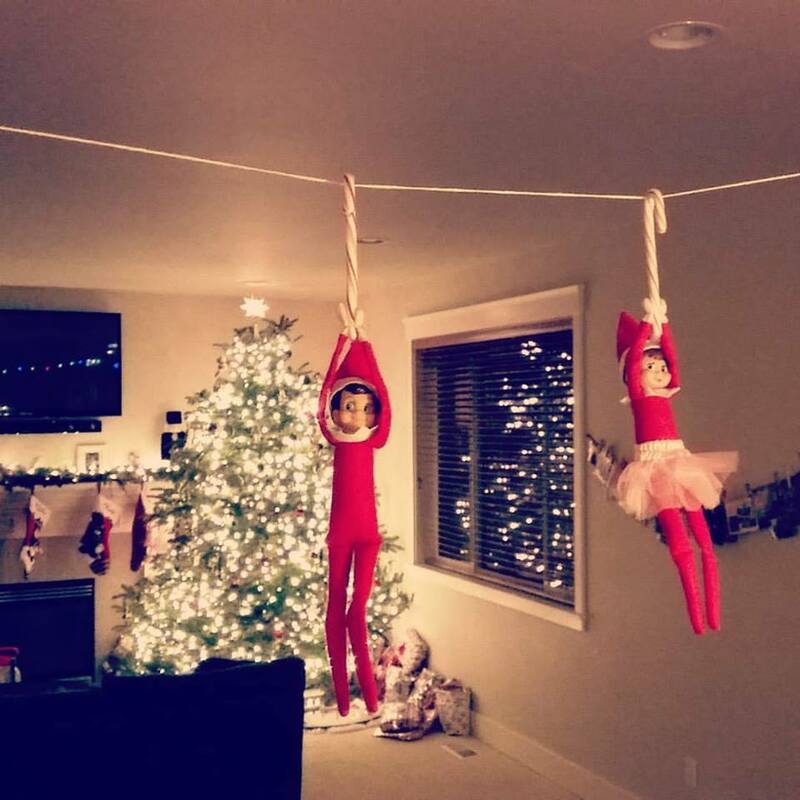 Either way, they hate the elf. 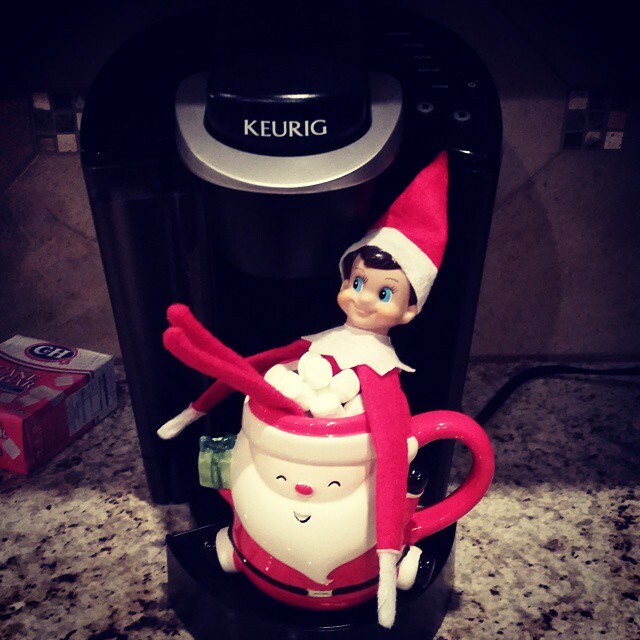 They (b) got an elf because of peer pressure or because it looked kind of fun, but loathe moving the little elf around, do it solely because their kids like it, regret getting an elf to begin with, and also pretty much hate the elf. 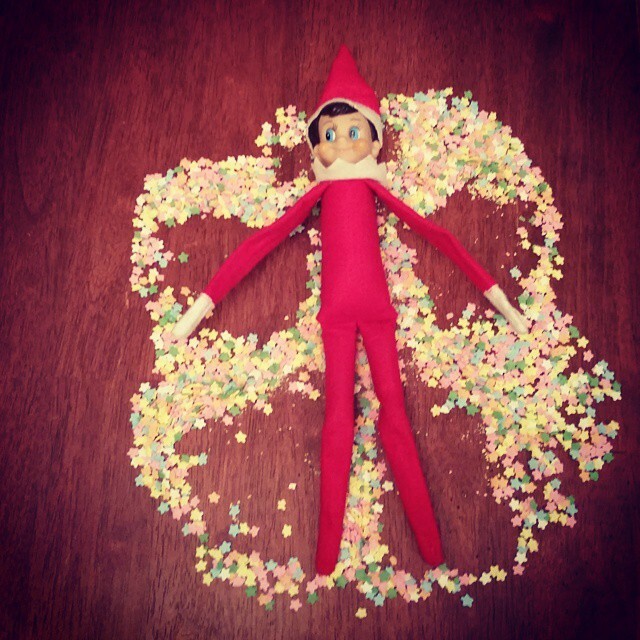 Or, (c) they LOVE the elf. 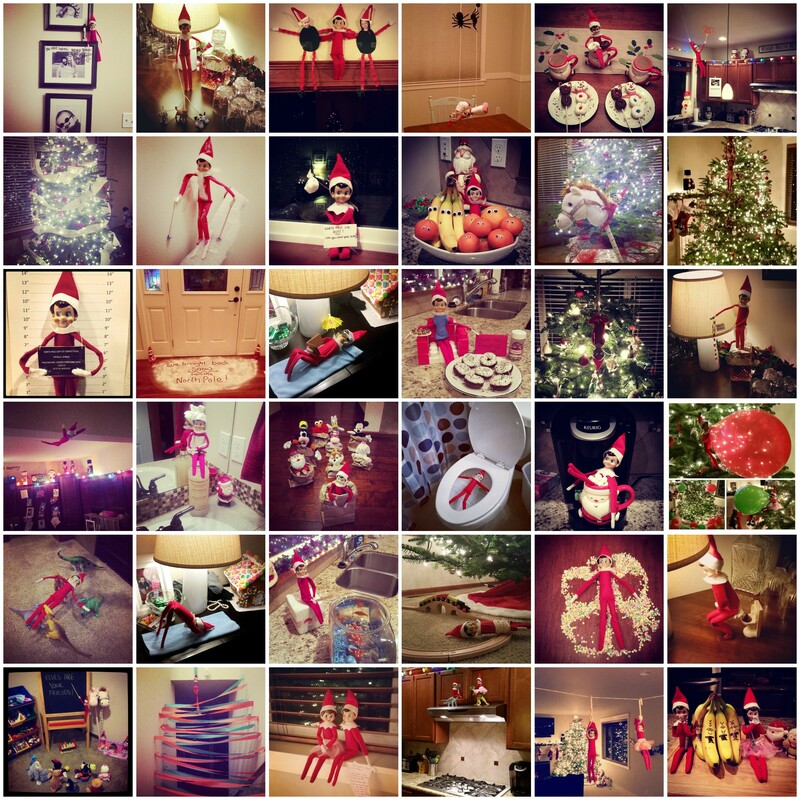 They enjoy scanning pinterest for new elf ideas, they have fun hiding it, they bring it out right on the day after Thanksgiving, and in some cases, they even buy more than one elf. 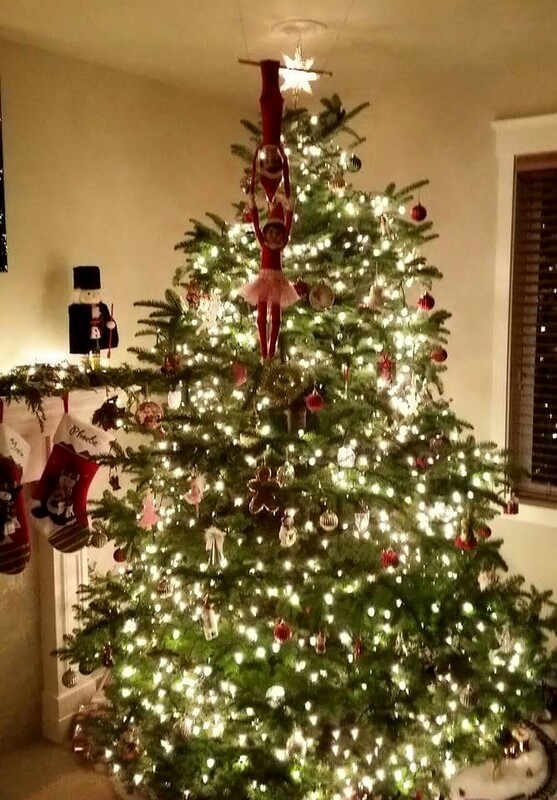 Are there nights that I don’t feel like doing anything extraordinary and I just stick the elf in the tree or on a shelf? Yes siree. Many, actually. 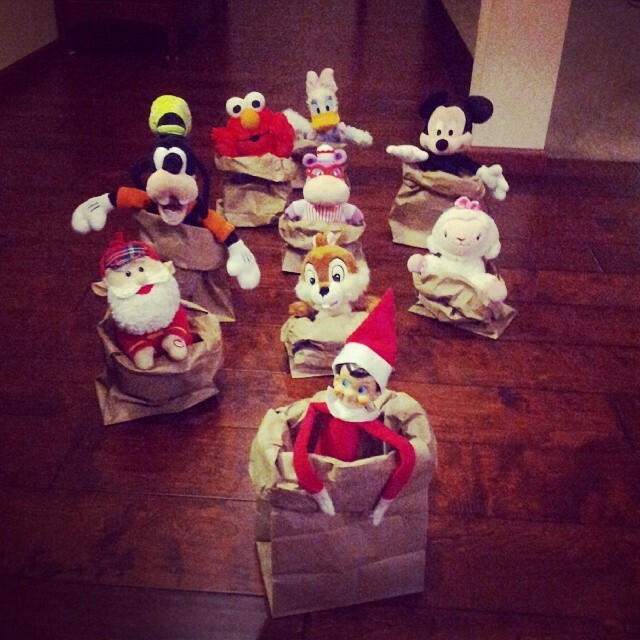 But oh man, I love watching their little faces light up when they come running downstairs in the morning to find them. So here they are, my greatest hits. 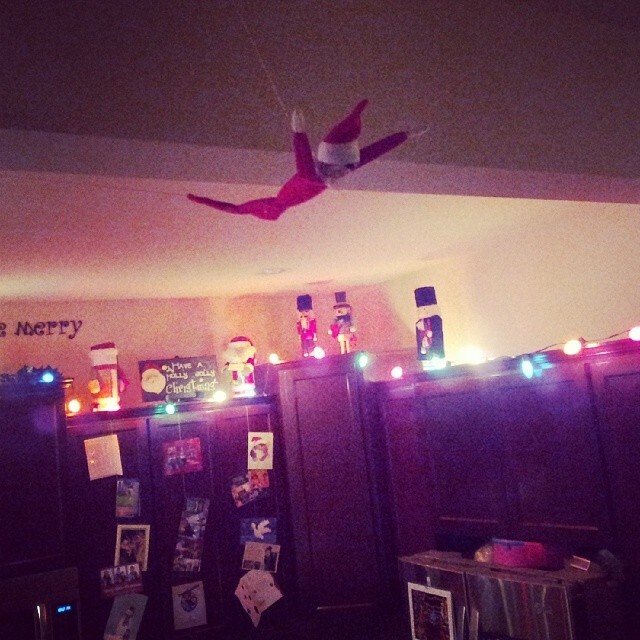 I have never, ever spent more than 10 minutes on the elf, and usually, it’s under 5. 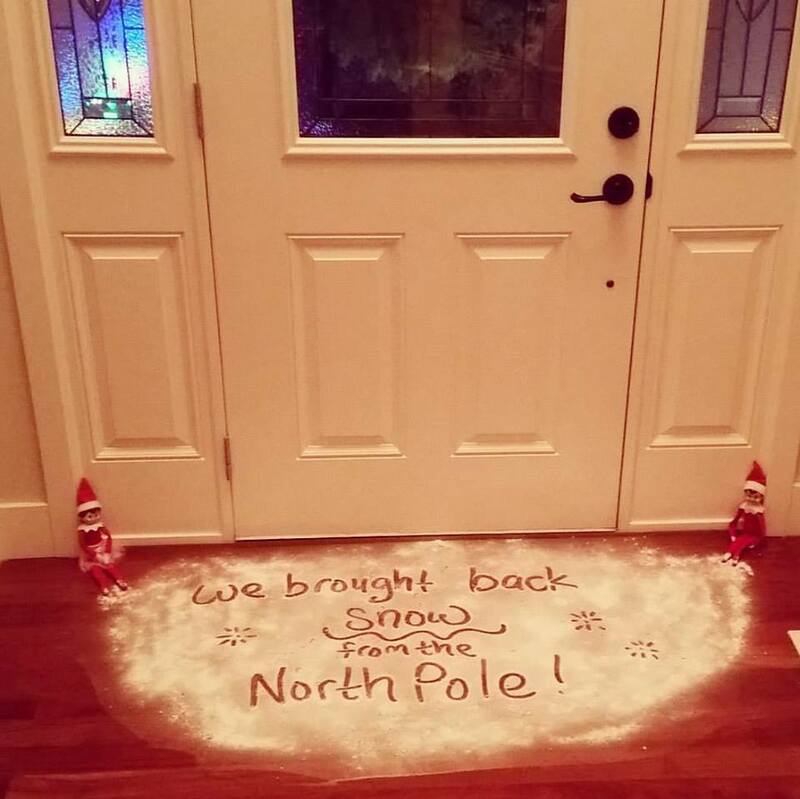 We brought back Snow from the North Pole! Just sprinkled around baking soda (non-sticky, easy clean up) and wrote with my finger! 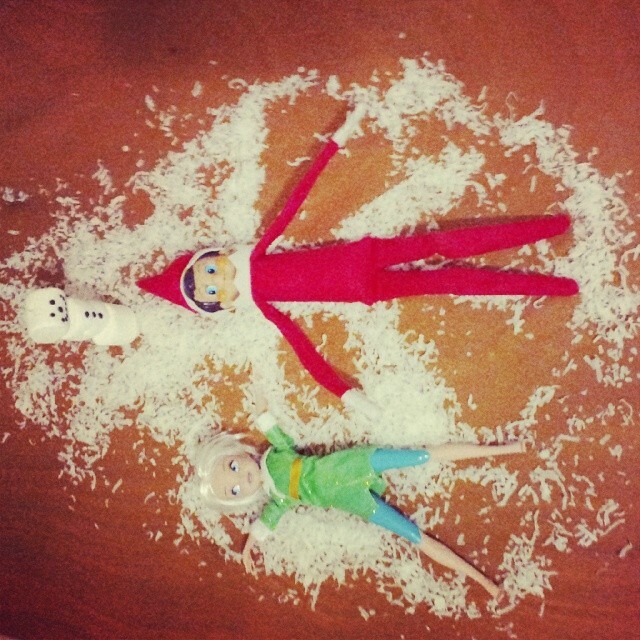 Put a little “snow” on the elves too, so it would look like they’d been playing in it. 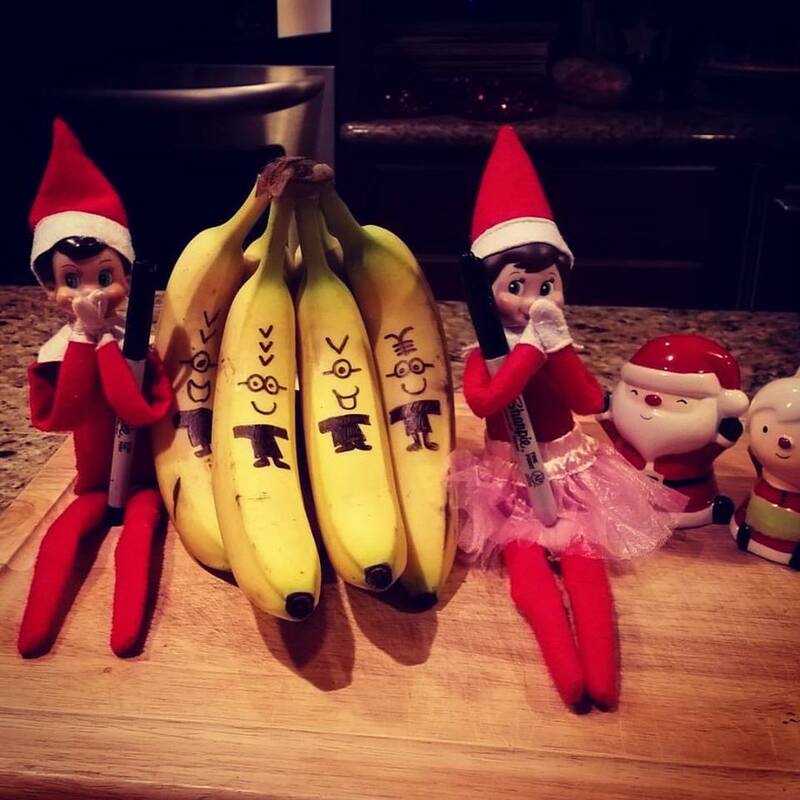 Banana Minions. Drew on with a sharpie. 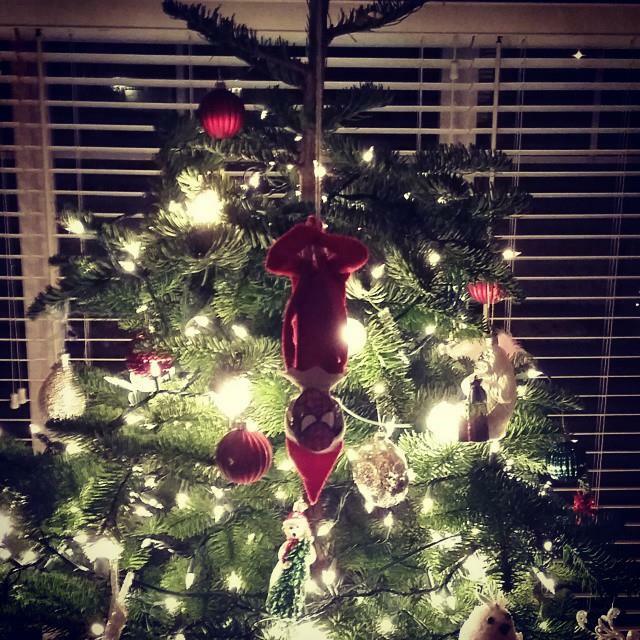 Took mere moments and my kids loved this one. 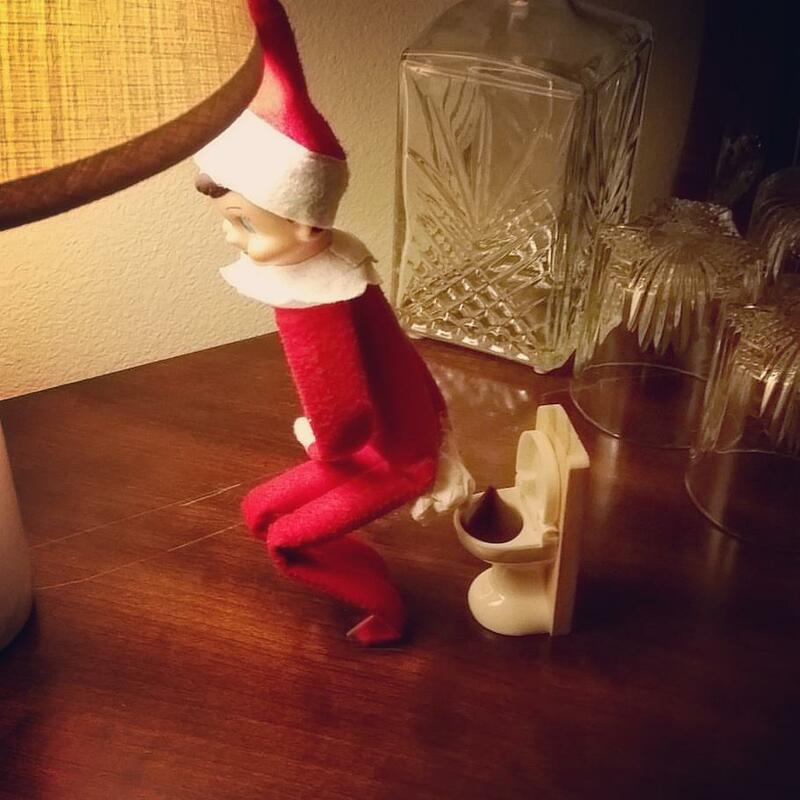 NOT FOR EVERYONE but a THRILL for my little potty humorists. 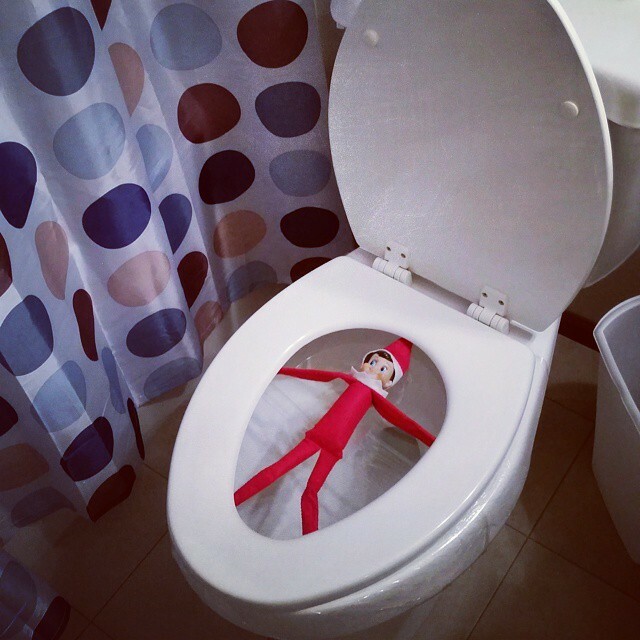 Doll toilet, hersheys kiss. 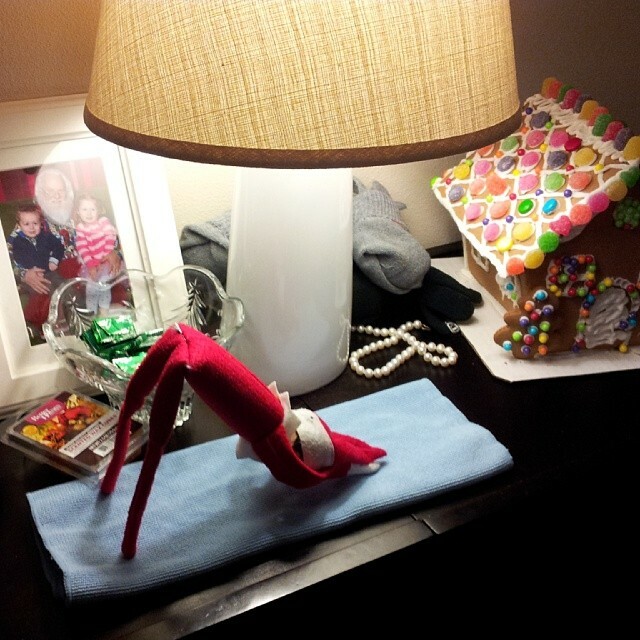 Used double sided tape to tape the elf’s hat to the lampshade, holding him up. Also used double sided tape for the toilet paper. Acrobats! 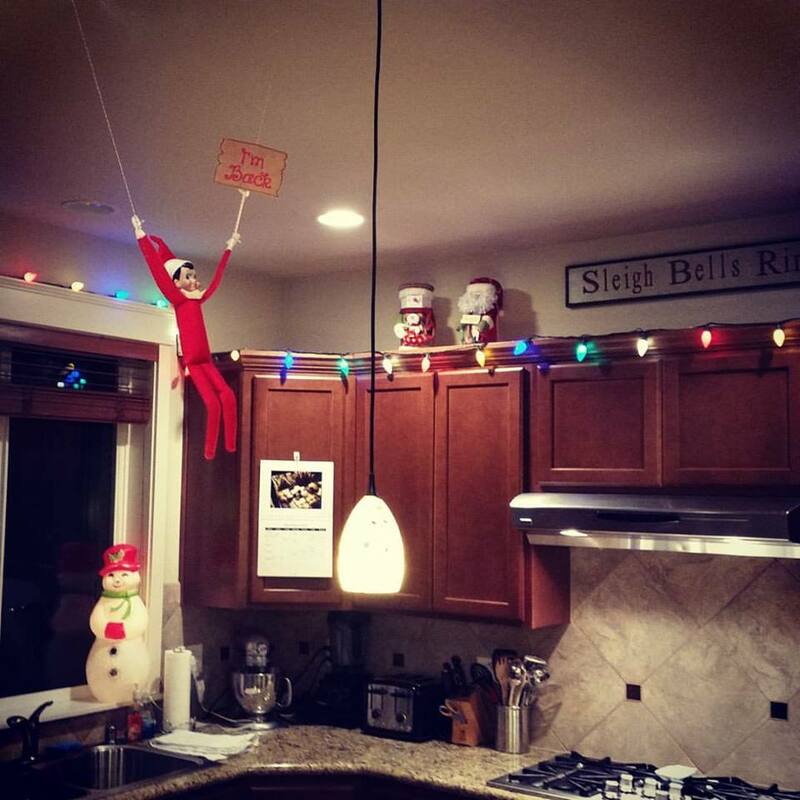 Hung from the ceiling with push pins and twine. 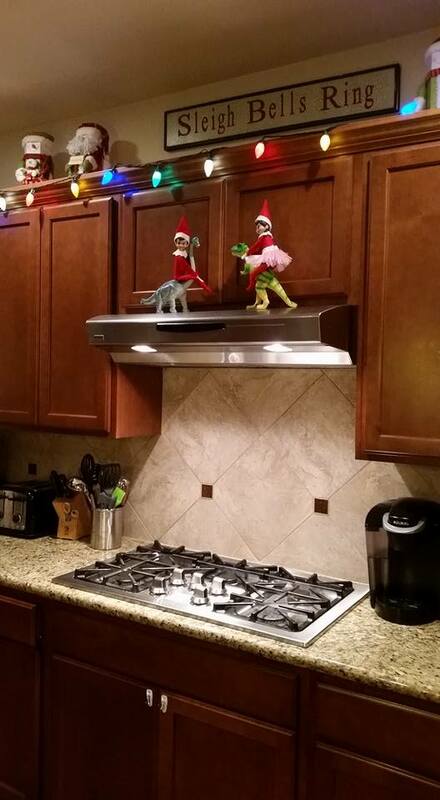 Riding on toy dinosaurs on the top of the stove fan. Attached with tiny rubber bands. 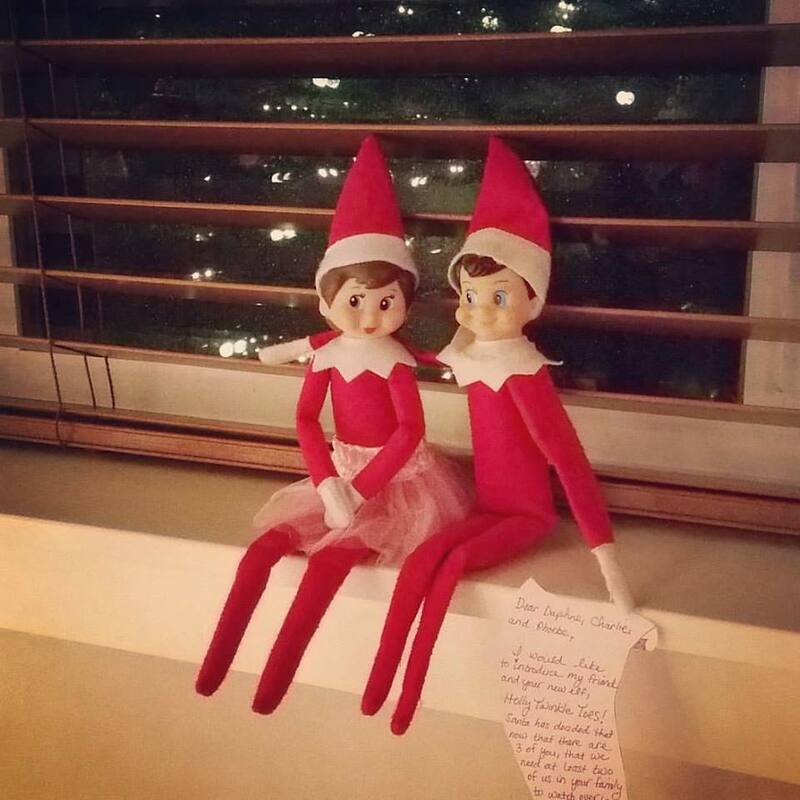 The day our second elf arrived with a note explaining who she was. 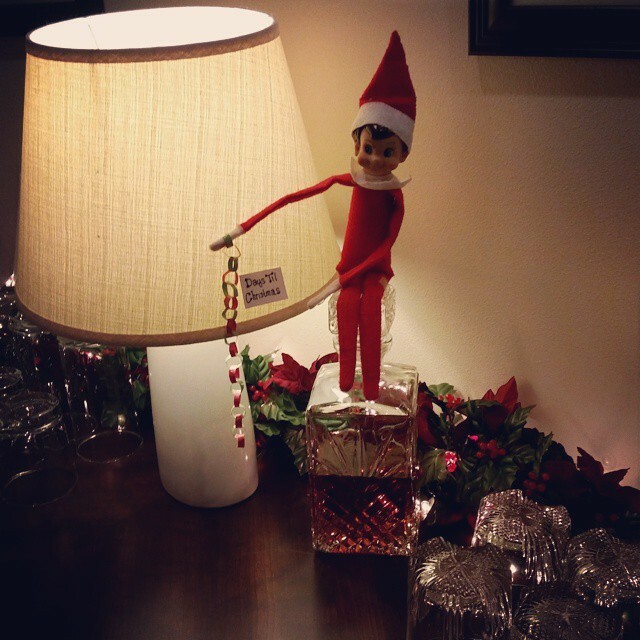 Days till Christmas chain. Made a tiny chain out of construction paper and tape. 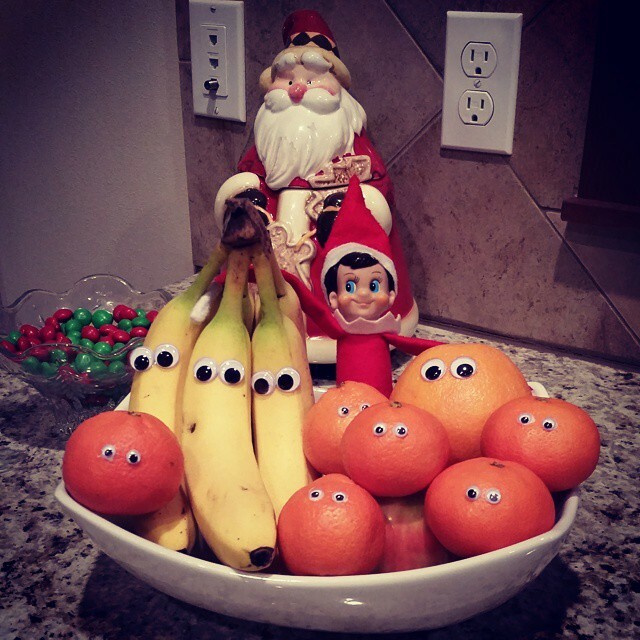 Elf brought breakfast! 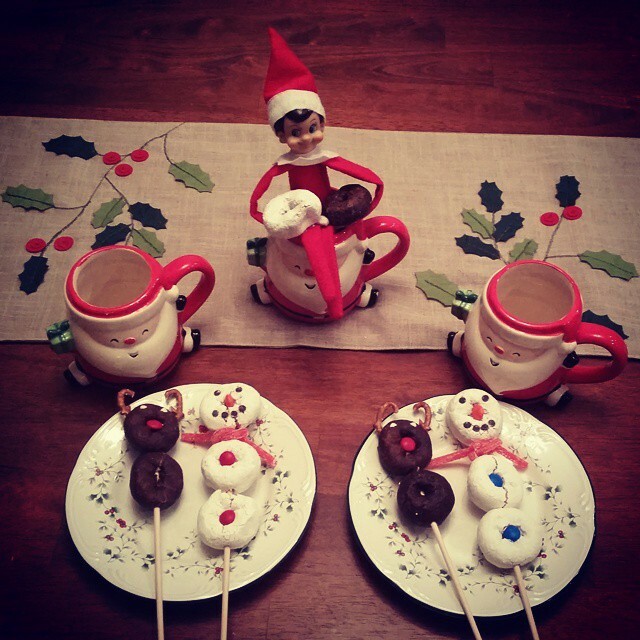 Just bought some mini donuts, put them on kabob sticks, and used M&Ms, pretzels, and licorice. My kids couldn’t BELIEVE they got to eat this for breakfast. I have done this one twice. 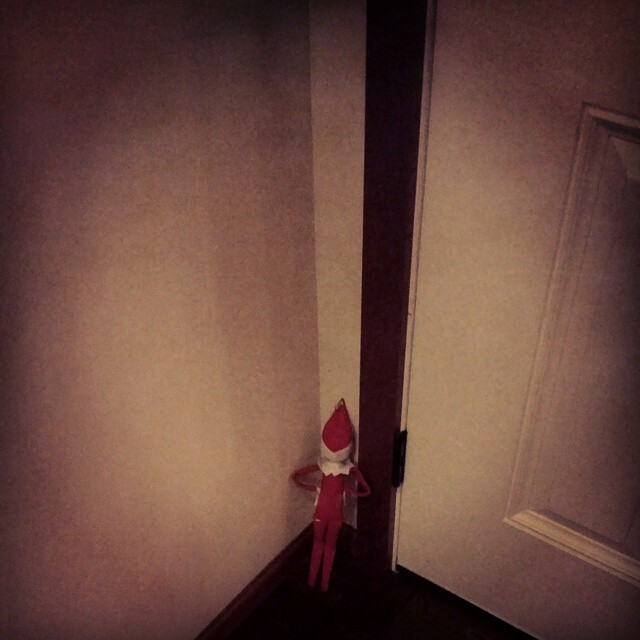 Elf in the time out corner. 3 seconds. Bam. Easiest thing ever. 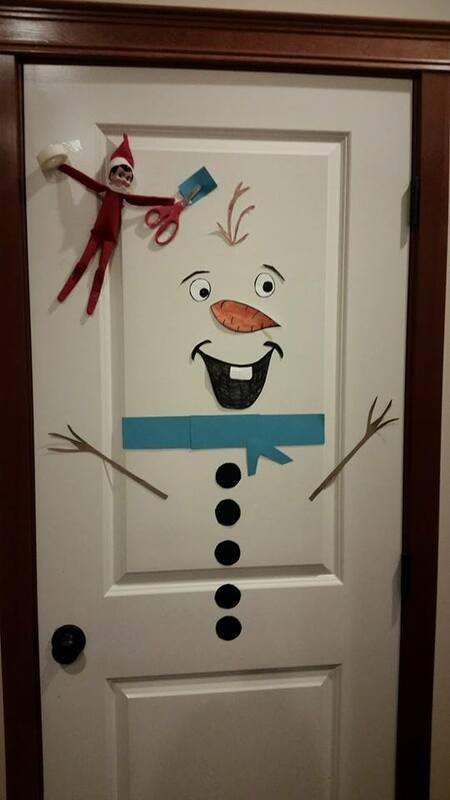 Googly eyes, elmers glue. One of my more time consuming ones. 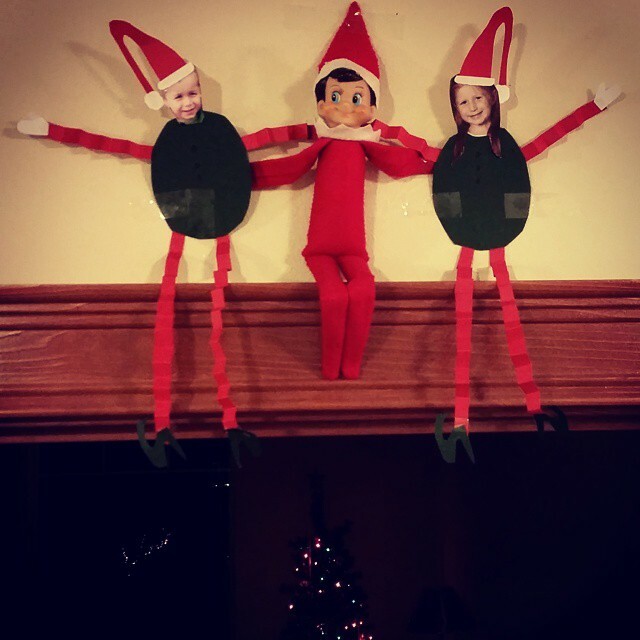 Put pictures of the kid’s heads on construction paper elf bodies and perched them above their bedroom door. They loved it though. Worth it. 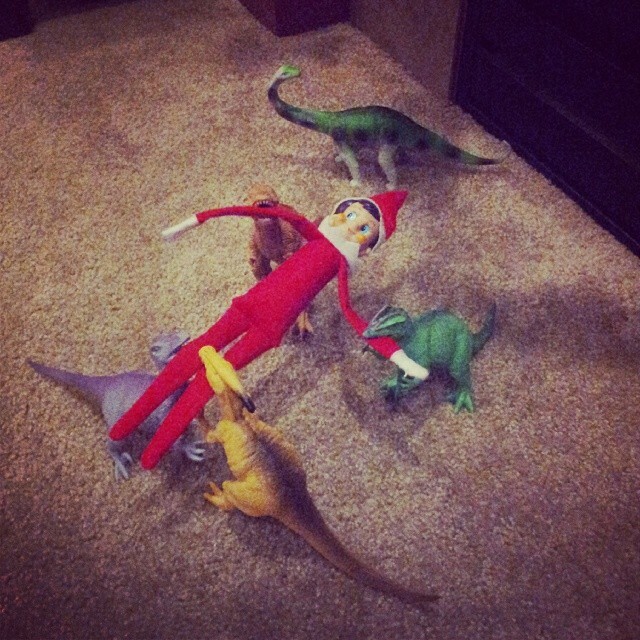 Elf walking the dogs. 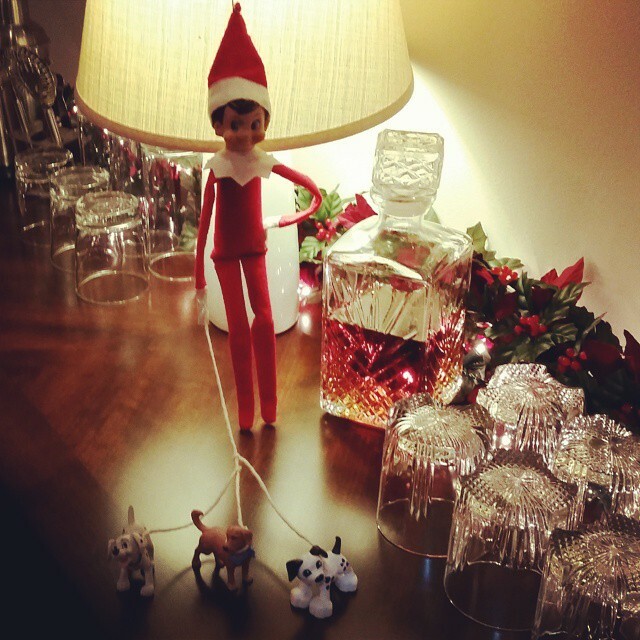 Some twine, some toy dogs, some double sided tape on the back of his hat to the lampshade. 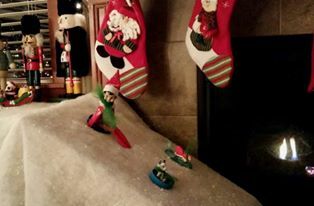 Skiing down the banister. 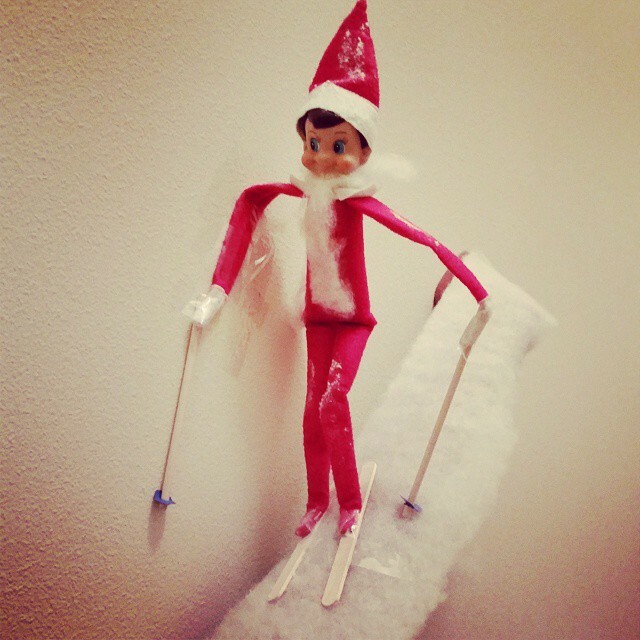 Fake snow, popscicle stick skis, surprisingly easy. 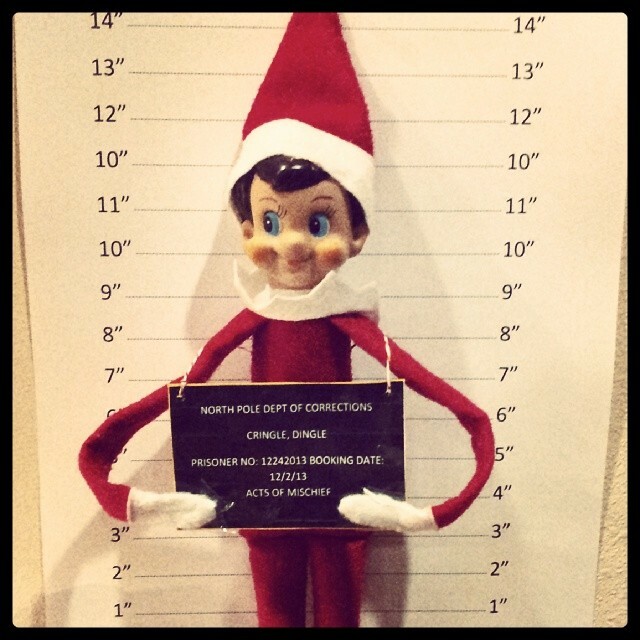 Put a little baking soda on his knees and hat. 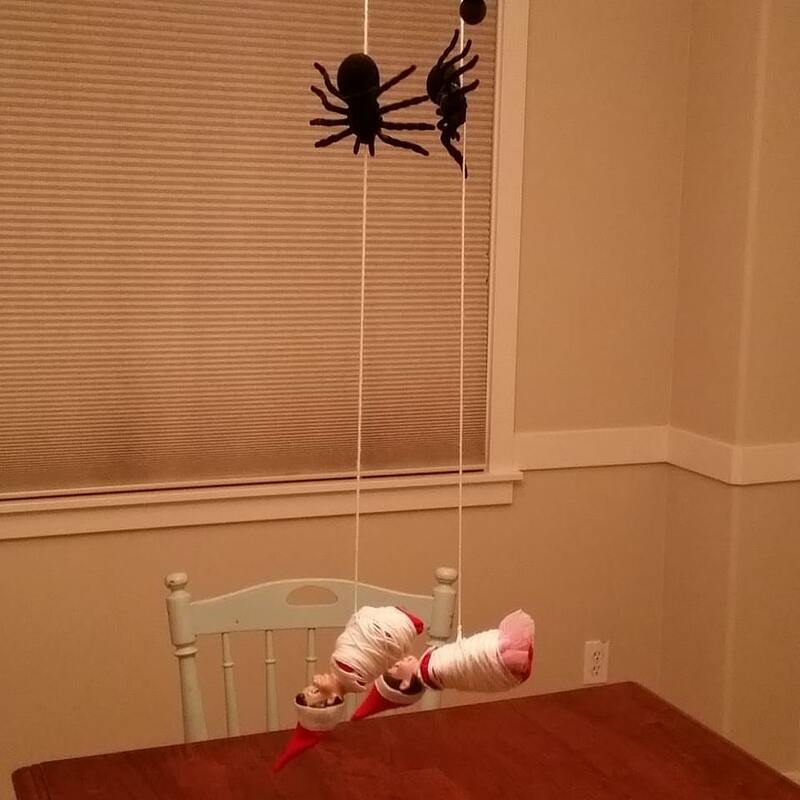 Spider Man Elf. Drew a little spider man mask, hung him upside down from the ceiling. 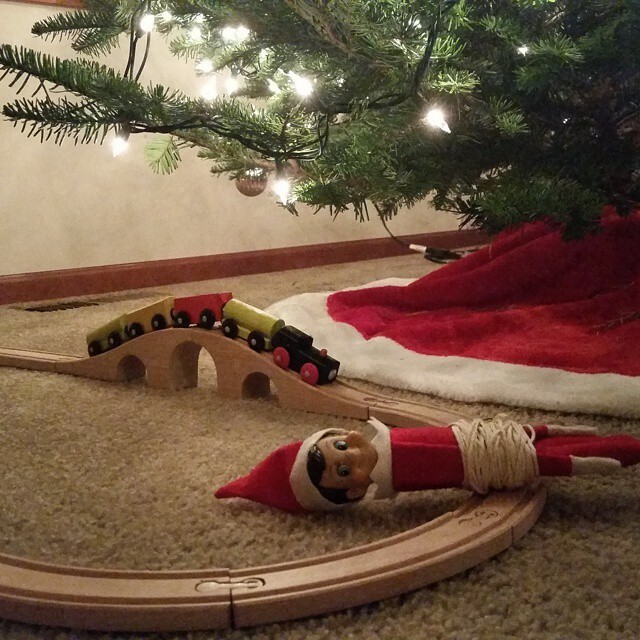 My son thought this was HILARIOUS. 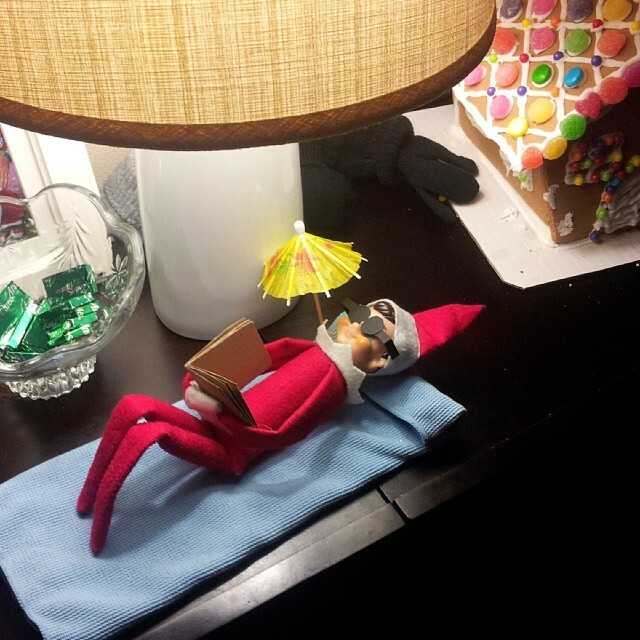 Elf Goodbye. Stick, paper towel, sign. Super easy. Saran Wrap over the toilet. Kids thought this was funny. 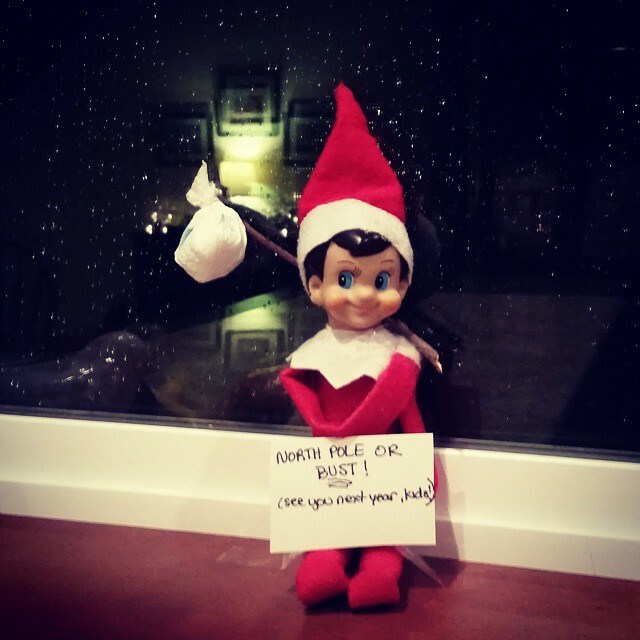 Husband, not so much, since he had to go upstairs every time he wanted to pee. 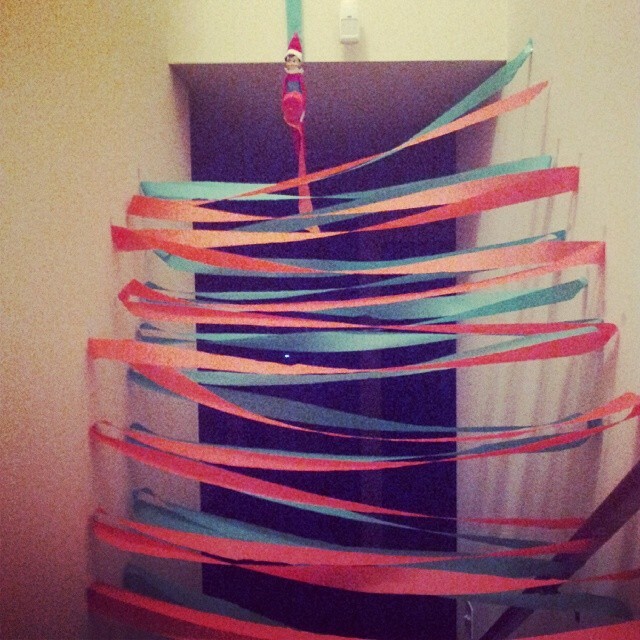 Elf used crepe paper to block the stairway, kids had to bust through it in the morning. 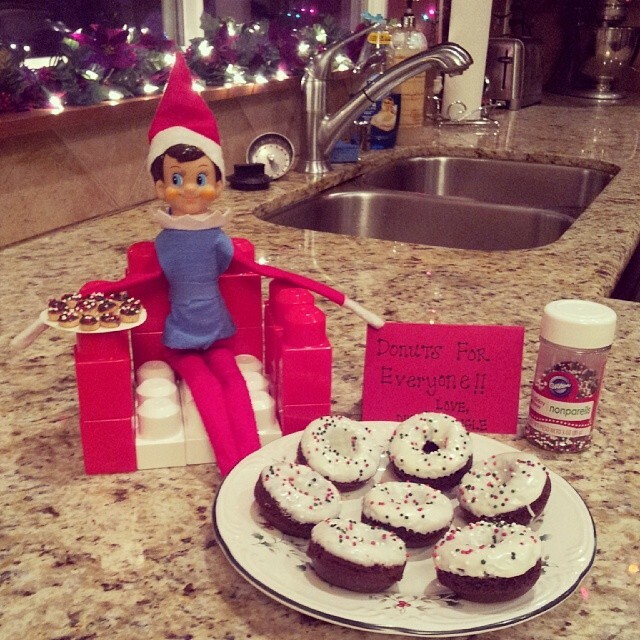 Elf made donuts. This one was time consuming because making mini donuts out of cheerios and melted chocolate takes more time than you would think. This was a full ten minute production. Gone fishing. This was a couple years ago. 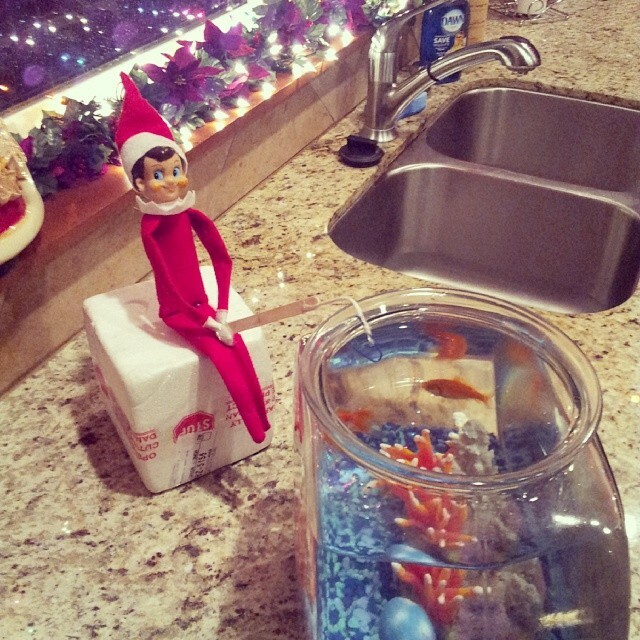 RIP to our goldfish Rudolph and Tarzan. Namaste. All I needed for this was a folded up washcloth. Sack Races in lunch bags. Easy. 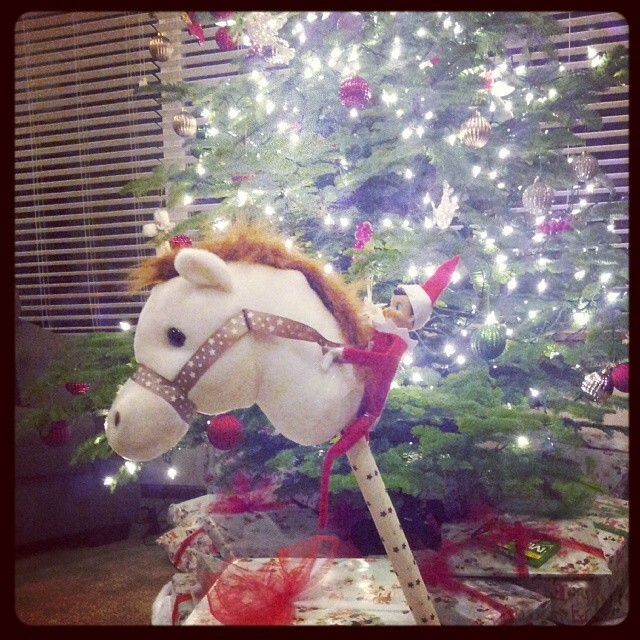 Think of a wonderful thought…. Secured with twine and push pins. 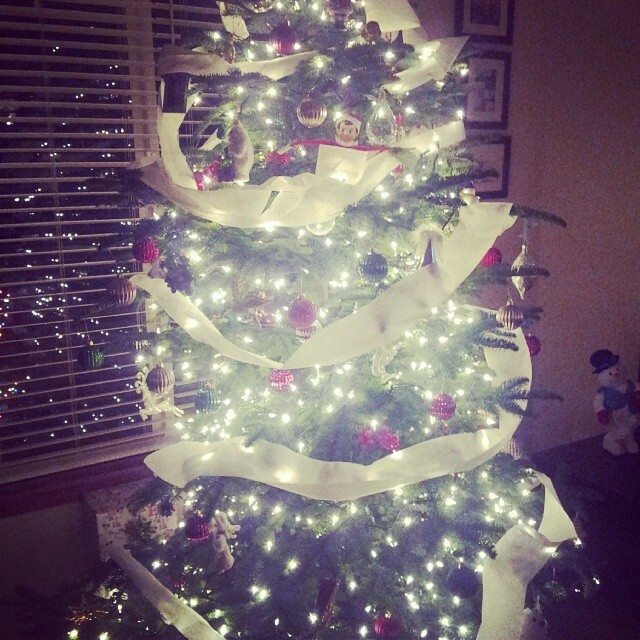 Toilet Paper’d the tree. 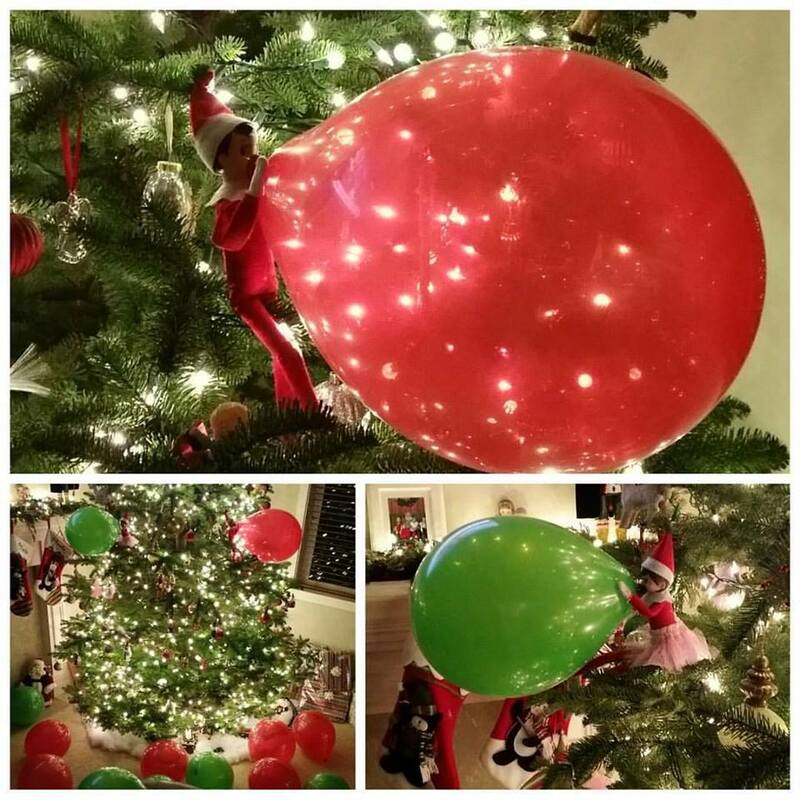 I do this at least once a year because it’s easy and the kids love it. 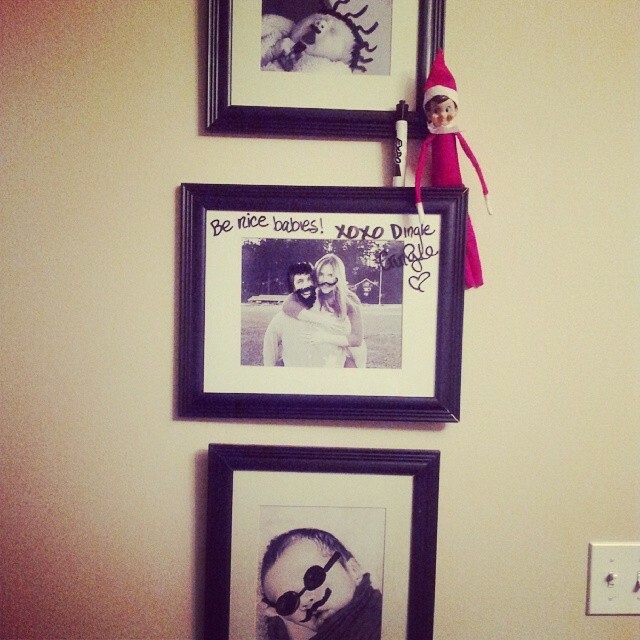 Naughty elf: Dry erase marker and pictures. The doctor is IN. 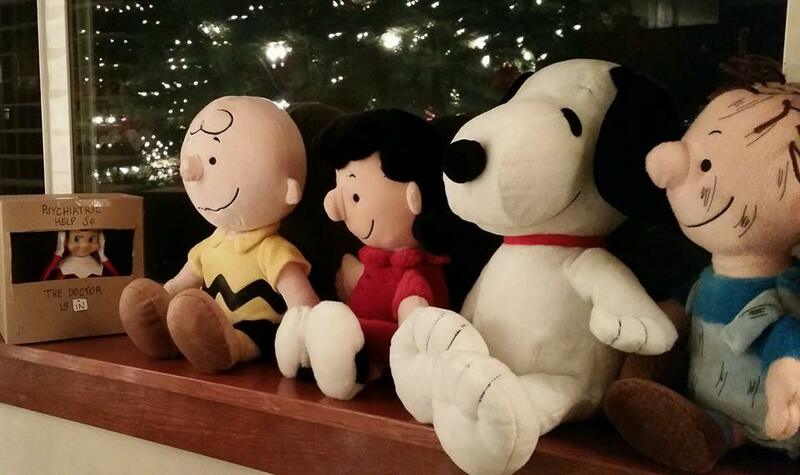 A hit for any Charlie Brown fans. 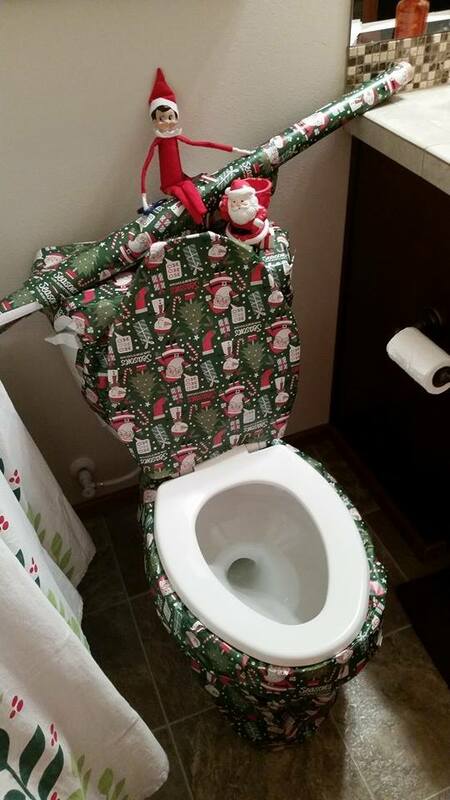 Wrapping the toilet. Easier than it looks.